For the floor plan evaluation, we will start at the rear entry door and work our way forward. 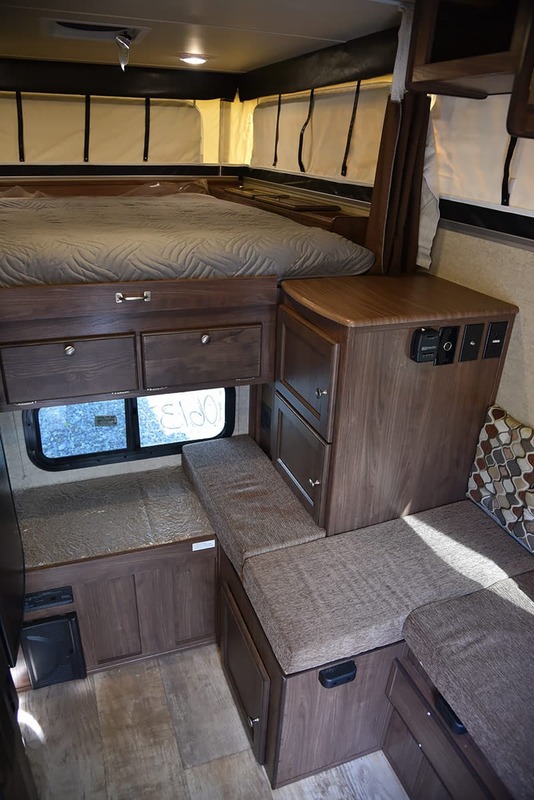 Immediately inside the entry door and underneath the dinette is the standard battery disconnect, Rieco-Titan roof lift system switches, the Rieco-Titan jack activation switch, and two large under seat storage compartments. 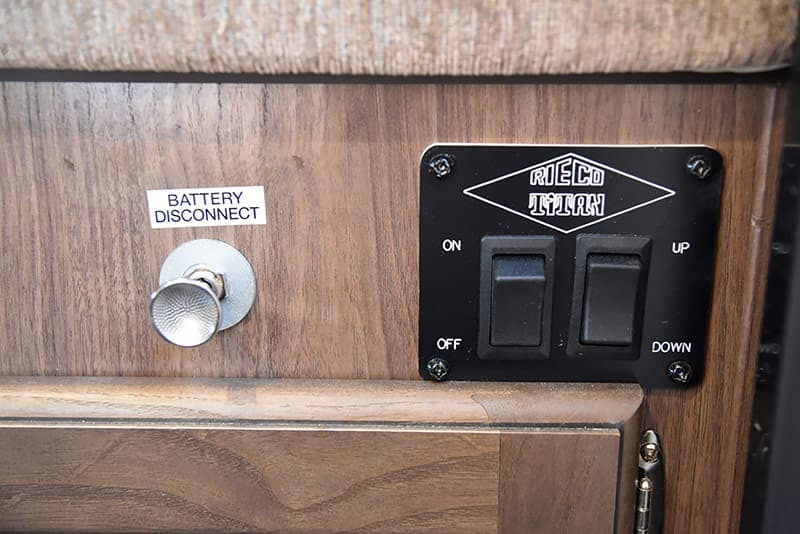 Having the battery disconnect and the Rieco-Titan switches right at the back door is absolutely perfect. 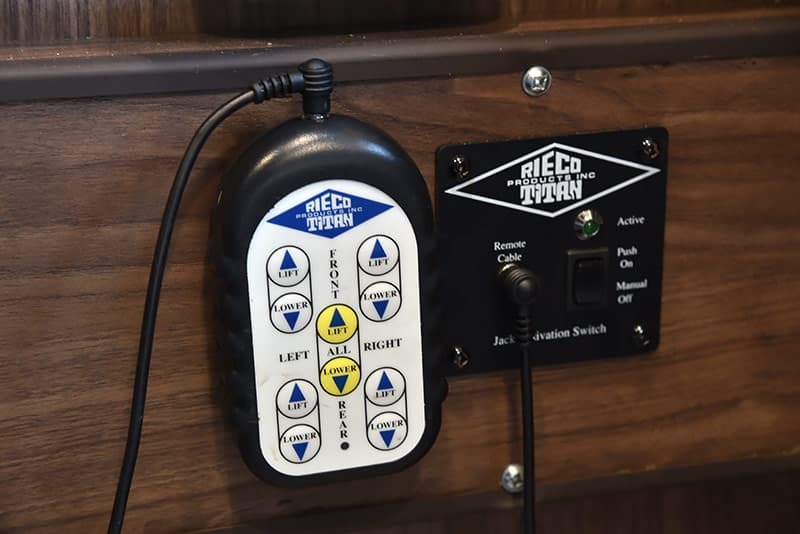 The Rieco-Titan electric jacks are an option on the Palomino SS-550. 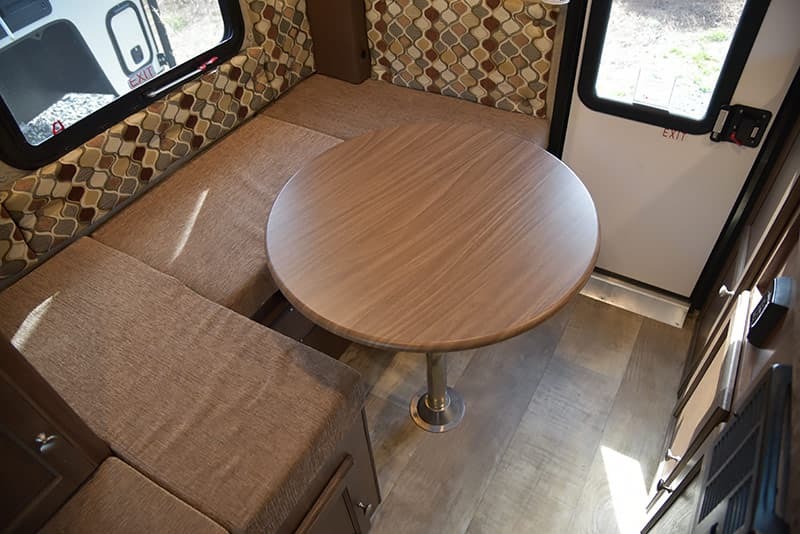 Stepping into the camper and turning to the passenger’s side, the U-shape dinette and round table presents an attractive seating opportunity with just enough leg and feet room for three adults. 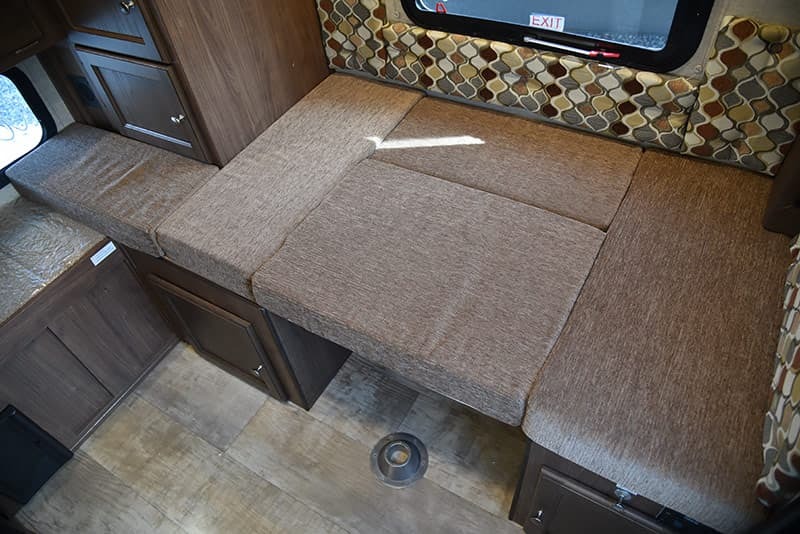 The placement and position of the table makes entering and exiting the dinette relatively easy, and the wall-mounted back cushions make the seating fairly comfortable. As a single post table, the table top could be more stable. Some may wish for more surface area for cups, plates, food, laptops, etc. We would also love the option of a more traditional rectangular table that would attach to the side wall for increased stability. That offer more eating and working space. Most folks using this camper will be singles and couples anyway, so why not offer a booth-style table option? 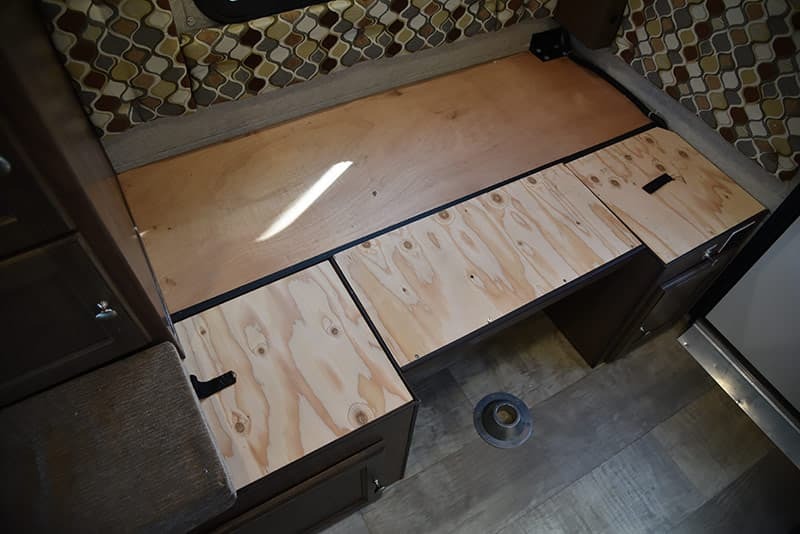 Turning the dinette into a bed requires removing the table top, removing the table leg, installing the included plywood bed piece, and arranging the cushions as a bed. The first time we did this, the process took less than a minute. 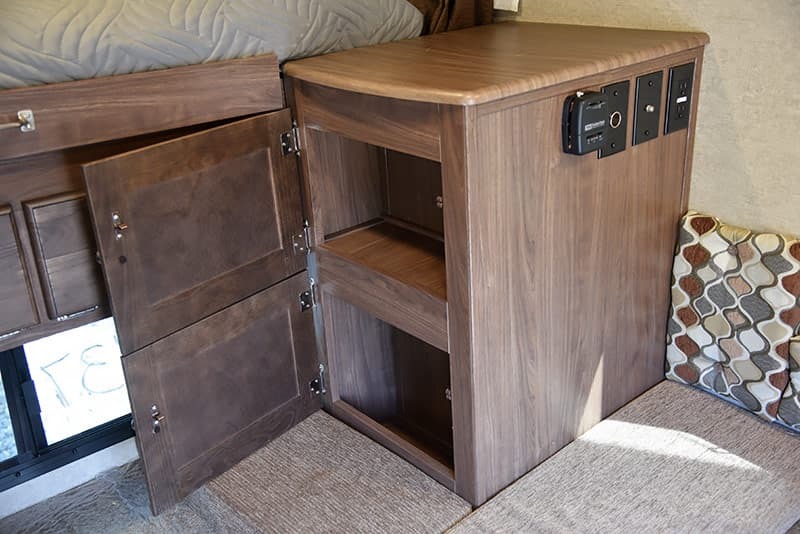 The table top and leg can be stored under the cabover bed. That is, if you haven’t already filled that space with your stuff. Otherwise, the table top and leg could be placed on the floor for the night. 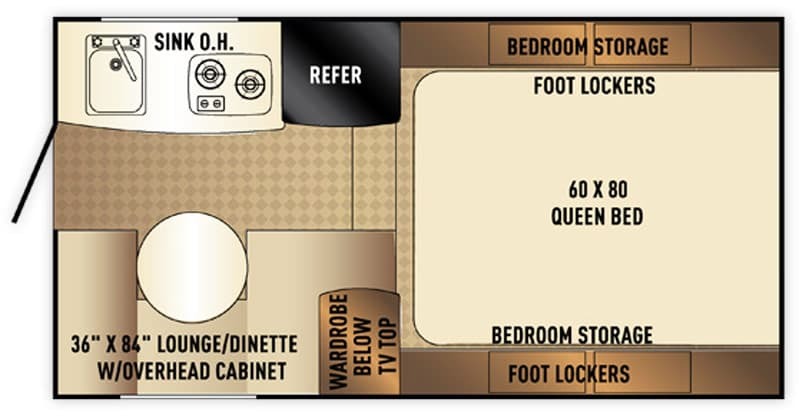 If the person sleeping in the dinette bed is tall, they will likely need to lie towards the rear wall and stretch their lower leg and feet into the narrow strip next to the central wardrobe (see above photo). Anyone who will be using this lower bed for tall adults may want to audition this sleeping position prior to purchase. 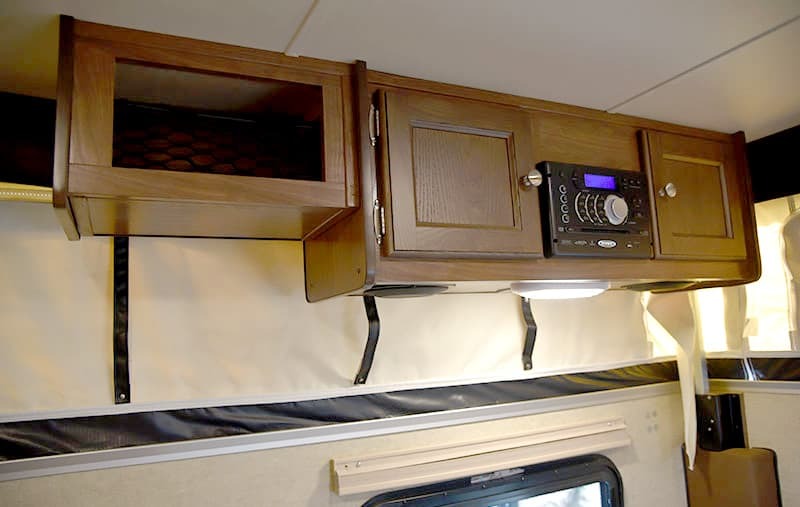 Above the dinette is a two-door storage cabinet, AM/FM CD stereo system with speakers, and a LED light. 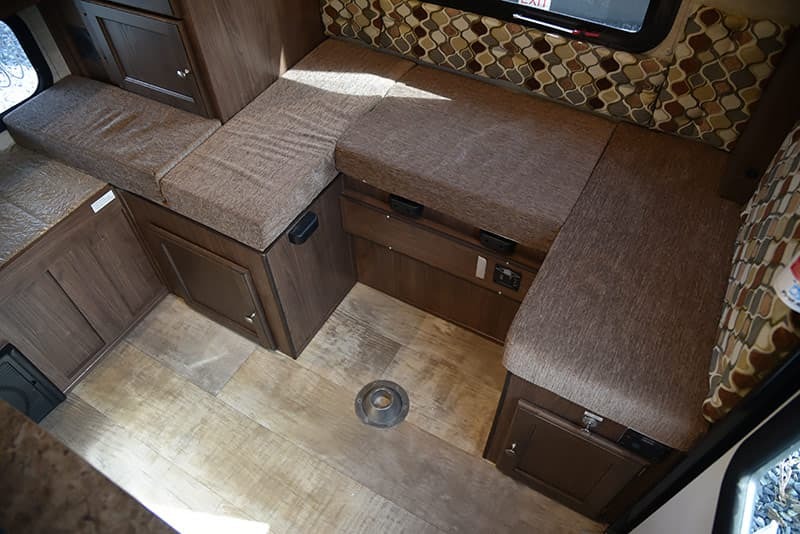 Having the stereo and LED light within reach of the dinette and kitchen area makes sense. 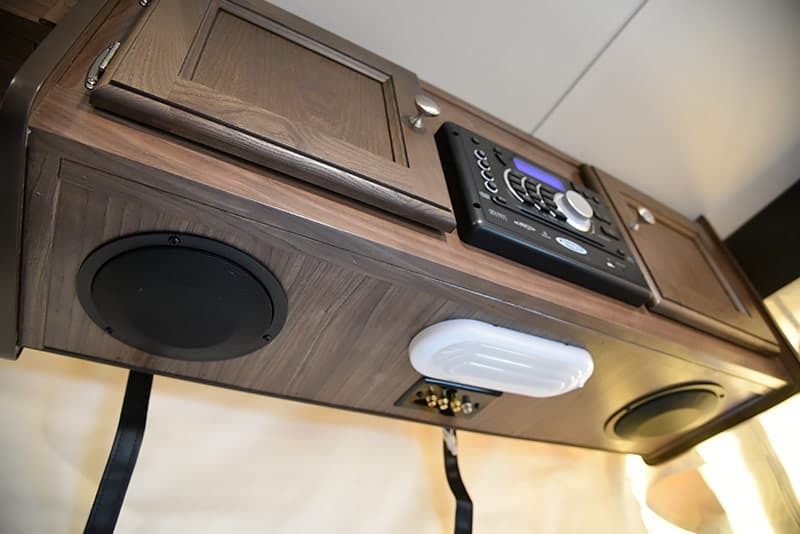 The forward dinette also features the thermostat, 12-volt outlet, coax connection, and a 110-volt outlet. 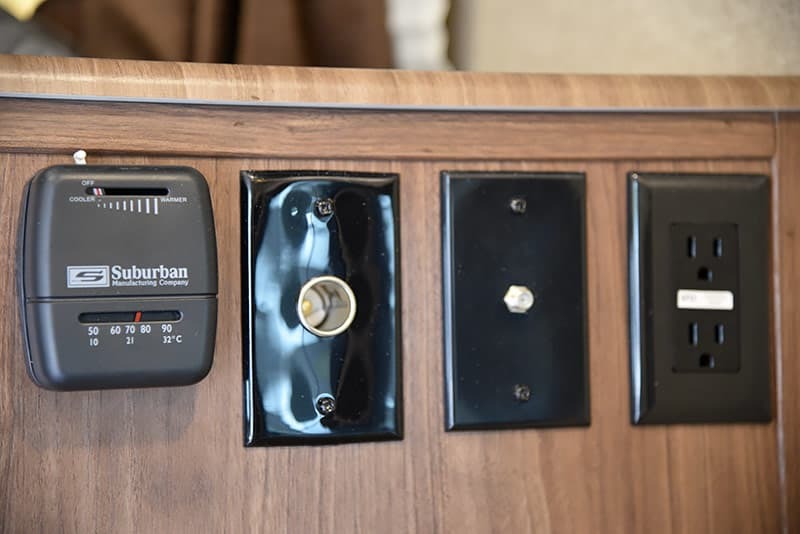 Having the outlets in a mid-camper location is excellent for charging cell phones and devices and plugging in laptops while on shore power. The only thing missing here is a USB outlet. These outlets are installed into a passenger’s side lower cabinet. This cabinet has two storage areas and offers a table top. Not only does the SS-550 have an impressive amount of storage areas, but the storage areas come in a multitude of sizes and shapes.